"Racing Under the Hill in Morton Mississippi"
Dad found this old flyer in a desk drawer yesterday and called me very excited. I thought he had found a million dollars. Looking at the inlarged picture from the flier, he can only identify one car. Larry “Killer” Keeton is the owner of the 1955 Chevy. The car is driven by Robert Earl McCaughn and pushed off by Rod Phillips in the jeep. Below is a satellite picture of Old Morton Speedway taken in 1996. The track was located on Old Hwy 13 just South of Morton MS.
Well let me tell you why we built the dirt track in Morton. Almost everyone who raced in the Jalopy Class at Jackson Sports Arena was from Morton. Sketter Morehead of Morton had an old Chevy II Jalopy that he raced with us at Jackson Sports Arena (JSA). He had cut down the body and just tack welded the body back together. He put duck tape over the welds and painted the car. It looked sharp from a distance !! While running hot laps one Saturday night at JSA, Bill Steadman hooked a tire and the car rolled over. The body just fell all to pieces. CE Smith asks if the car could be fixed before the race. Sketter looked at all his friend around the car and we all said sure. Everyone in the Jalopy Class went to work trying to get it ready. We fixed the tire, replaced the battery by using one from someone's truck and completely pulled the body off the car. 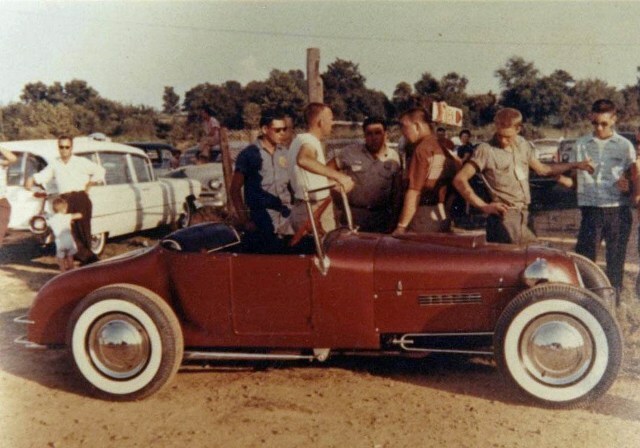 When the cars took the track for the jalopy race, Skeeter's car came out with only a frame, motor and a role cage. During the worm up laps the flagman black flagged the car. Bill refused to leave the track. They stopped the cars on the front stretch and ask Bill to take the car back to the pits. Charles Steadman, Bills brother, was driving the car on the pole that night. He called the flagman over and told him about all the work everyone had done and if that car didn't race then he wouldn't either. The cars made one more worm up lap and the black flag came out again. Charles (on the pole) took his car to the pits and everyone on the track followed him. CE Smith was hot. He ran down to the pits and told us all that if we didn't take the track and finish the race, none of us would ever race there again. We all loaded up our cars and left. We built the track in Morton and raced there for one season. JSA begged us to come back the next year and we did.